We may admire complexity, but we love clarity. Subtlety and ambiguity can be clever, but when you're on the receiving end, you're apt to be frustrated and less efficient -- especially in business. Consultant and author Bill Jensen conducted a detailed study of how employees cope with intra-company communications and other issues, concluding that simplicity equals clarity equals effectiveness. In this context, complexity is often a waste of time. Furthermore, many of the e-mail memos and meeting reminders we receive can be safely ignored at no risk to the organization or the employee. Jensen writes: ``Companies are communicating a lot more, but little of it truly helps employees make informed decisions. It is disheartening to see how few companies work backward from the needs of their employees. Almost none of the utility and usefulness of corporate communication is driven by employee needs. It's almost entirely based upon senior executive's views of what's needed. Jensen's ideas are presented in a cleanly designed, intelligently organized volume. It's astonishingly well grounded. Most books of this type seem to be aimed at citizens of parallel dimensions and are not useful to those of us living and working here on Earth-Prime. Clearly, the author has fought his share of corporate battles -- large and small -- and learned how to survive and thrive. Hardly Machiavellian, Jensen is disinclined toward power plays and plots, but favors the prevention of needless work and wasted time. This extends to dealing with managers, colleagues, careers, goals, budgets, projects, performance appraisals, tools, training and more. And true to his agenda of simplification, Jensen suggests that readers pick only three or four chapters to concentrate on, eschewing the rest. He also has a website ( www.simplerwork.com) with several sample chapters and other tools, though he requires registration that captures users' e-mail addresses. 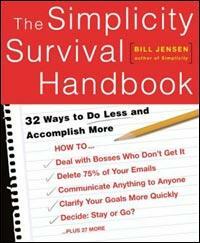 Overall, The Simplicity Survival Handbook is an impressive and intelligent tool for office drones who care enough to refine their craft and astute managers who want to support the idea of working smarter.